Golden Week is the long holiday period which lasts from the end of April to the beginning of May in Japan. We will introduce events to visit and tips to use transportation means during Golden Week. Golden Week (ゴールデンウィーク, GW) is the long holiday which lasts from the end of April to the beginning of May in Japan. The length of the holiday depends on how the weekend and the national holidays connect, resulting in a week, sometimes even 10 days off. A festive atmosphere spreads all over Japan once Golden Week starts as there are a lot of events going on during this holiday. Golden Week is the time for Japanese people to go back to their hometowns or travel around. Because of this, you will run into traffic jams and crowds at the major transportation hubs. So you need to be aware that you might not be able to move and visit places as you want. Roads and trains from Tokyo will be crowded at the beginning of Golden Week period as people living in Tokyo usually go back to their hometown or travel to some other parts of Japan. On the other hand, roads and trains to Tokyo will be packed at the end of the Golden Week period as everybody goes back to Tokyo. So please consider this when you make your plans. However, the period right before and after Golden Week is the time when the Japanese don't travel much. If you come to Japan right before or after, you can avoid being stacked in one place. Moreover, you might find more reasonable prices for accommodations. As mentioned above, the dates of Golden Week are different every year, so please check the exact period out in advance. We must say that Japan during the Golden Week is quite different from usual. We highly recommend you plan your trip taking these details into consideration. The Salt Road was used to transport salt from the ocean to the central Honshū (the main island of the Japanese archipelago). It might remind you of the Silk Road. "Chikuni Kaidō" was one of the roads leading from the Sea of Japan to Shinano province (present-day Nagano prefecture). A half-day walking event called "Salt Road Festival" is held from May 3rd through the 5th every year in Nagano prefecture. Participants walk almost 10 km on this road in half a day. 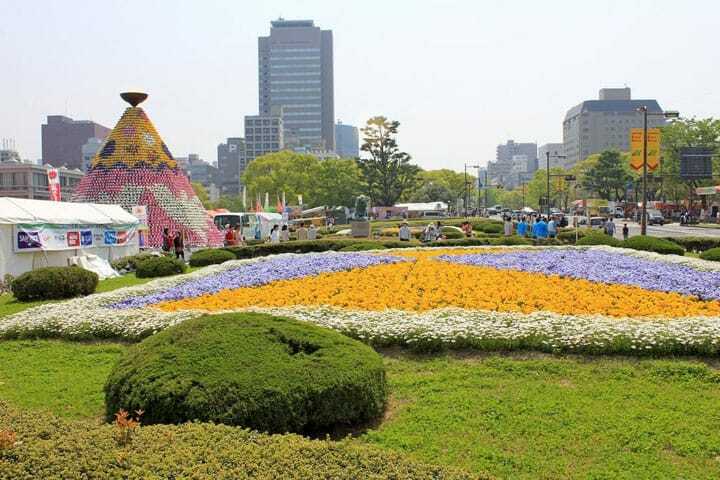 Hiroshima Flower Festival is held from May 3rd through the 5th in Hiroshima prefecture. There are various shows like dance shows float parades held by the citizens of Hiroshima. This is one of the largest events in Japan as about 1500,000 people visit every year. Arita Tōki Ichi ("Arita Porcelain Market") is held annually from late April to early May in Saga Prefecture. This year, 2016 it will be held between April 29th and May 5th. The craft to create Arita porcelain ware has been transmitted from the 17th century. At this market, you will have the chance to buy Arita yaki (Arita ware) at reasonable prices. Arita porcelain ware is a favorite souvenir for many travelers. You will surely enjoy even just looking around the market. Hakata Dontaku Port Festival is held from May 3rd through the 4th in Fukuoka Prefecture. Out of the many things to see there, traditional dance parades held by citizens and flower parades a must see shows. This is one of the largest festivals during Golden Week. Omiya Bonsai Festival is held annually from May 3rd through the 5th in Saitama city, Saitama prefecture. Bonsai is an art of growing plants and trees in containers. There are bonsai exhibitions and about 120 specialized shops selling bonsai at this festival. Read Also: Spots You Must Visit in Saitama Prefecture! 5 Unique Traditional Crafts Of Saitama: Japanese Paper, Silk, Dolls And More!